Cheap Butterfly Sunglasses - 12 Ct. 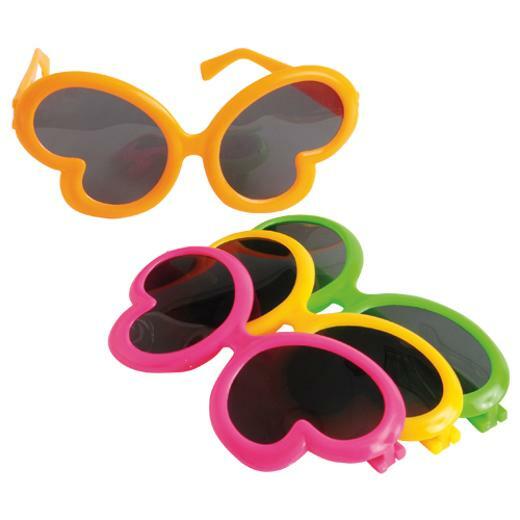 Shake off the Winter blues and bask in the Springtime sunshine with these butterfly sunglasses. A great addition to your party favor bags, kids will love this brightly colored fashion accessory. Unleash their inner supermodel as they strut their stuff with this wing-shaped eyewear. Great for Easter baskets. Glasses and sunglasses make great party favor gifts or Halloween costume accessories. Create a fun new look with a pair of glasses or hand out sunglasses at your next pool party. L: 1.9 in. W: 5.95 in. H: 11.5 in.